If you’ve connected your Raspberry Pi system, you’re ready to power up your Pi for the first time. You have to do some extra work before you can start using your Pi, but don’t worry. It’s not hard and you only have to do it once. Plug the adaptor into a power socket. If the socket/four-way/power strip has switches, make sure they’re on. Life! Action! Things should happen on the screen. If you set up NOOBS correctly, you should see something like in the following figure, with a list of options. When you see the screen, use the mouse — you did remember to plug it in, right? — to click the two top checkboxes. 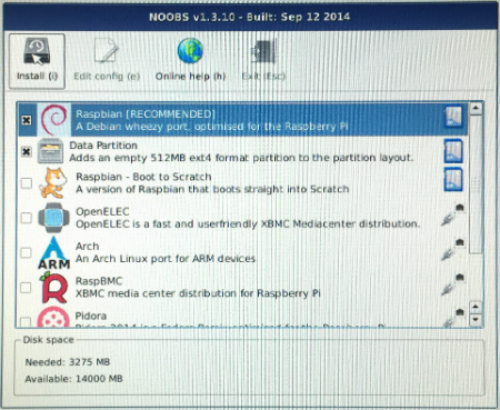 You want the ones that say Raspbian [RECOMMENDED] and Data Partition. Click the Install button at the top left or press i on your keyboard. Click Yes when the Pi asks whether you want to overwrite the memory card OMG blah blah techno-blah. You see the screen in the following figure. 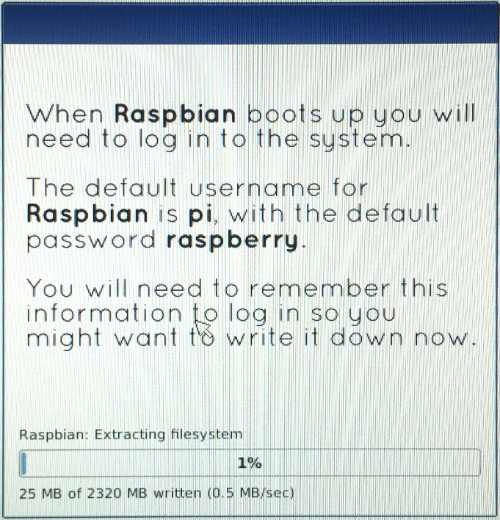 The Pi starts installing Raspbian. If you have nothing else to do, you can watch the progress bar at the bottom of the screen. It takes 10 to 15 minutes to finish and the messages it shows aren’t all that interesting, so you may as well go do something fun while you’re waiting. Make a note of the details on this screen — the username pi and the password raspberry. You need them when you start using your Pi. If you forget them, your Pi won’t let you use it, and that will be very bad.